In Sales, timing is everything. You can have the world’s most talented sales team and the greatest product but still lose to a competitor. The fastest way to respond to a prospect is through live chat on your site. Contact forms still have their place, but there’s a delay between when someone fills out a “request a demo” form to when an SDR follows up. This follow-up process can last days or weeks as SDRs battle to catch the prospect live or get an email response. Do you email every single lead in your database when you fire off a nurture campaign? Then why would you make live chat available to every lead that visits your site? Doing so can prove to be very costly. Your SDRs should be focused on diagnosing the needs of qualified prospects and providing them with a personalized experience, not having conversations with every person that comes to your site. Thankfully, it’s now easy to offer live chat only to prospects who match your ideal customer profile. 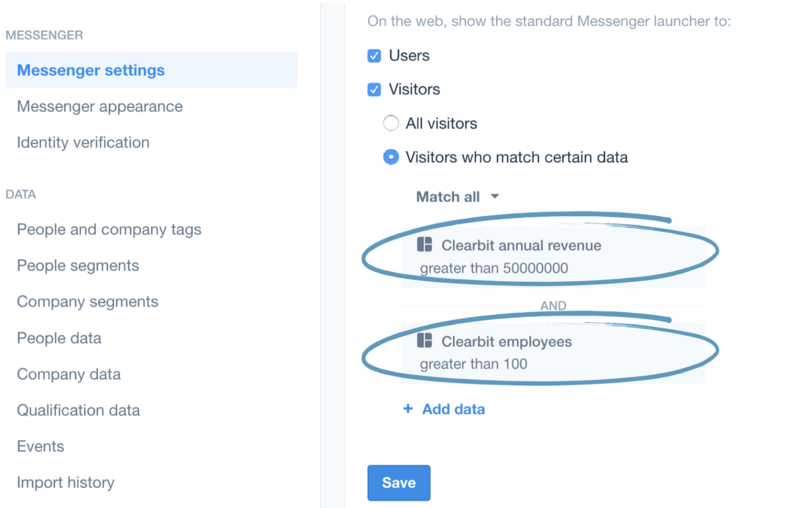 By leveraging tools like Clearbit, you can choose the subset of leads who will see a messenger on your site. Maybe you only sell to B2B SaaS companies under 200 employees. With a couple of clicks you can pick the criteria that makes sense for your business. Being selective about who you chat with will ensure your SDR team is making real progress towards their goals. It’s also a sustainable way to drive live chat adoption across your sales organization. Your reps will be more motivated to use live chat when they see its ability to deliver a constant flow of high-quality leads. Over-automation has tarnished the reputation of Sales and Marketing. We’ve all encountered pesky Robo-Dialers and spammy automated emails. Live chat is the newest frontier, but some marketers are adapting the same ineffective tactics used in the email and phone era to this medium. No one likes to feel like a number. And, nothing annoys prospects more than having a prolonged conversation with a chatbot when they thought they were going to talk to a person. of automation and human connection. Modern sales and marketing requires the right balance of automation and human connection. Our most successful customers use our bot, Operator, to automate the collection of contact information (email, company name and company size), while allowing their SDRs to build valuable relationships with prospects. Making live chat conversations personal is the most efficient way to making each interaction as human as possible. 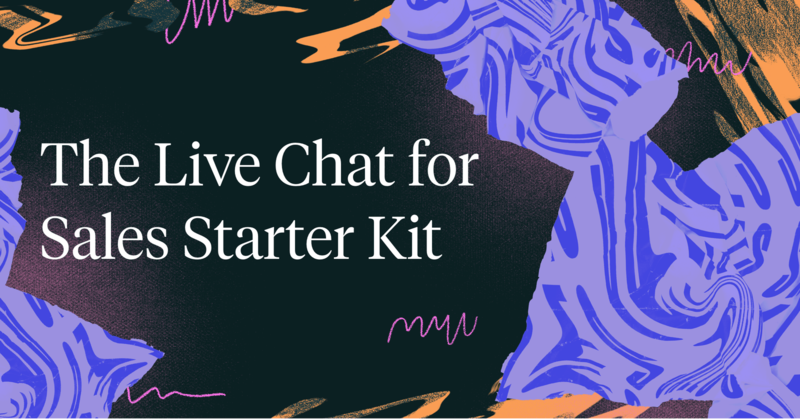 Prior to having your SDRs jump on live conversations, spend some time determining how you will route chats to individuals or team inboxes. For example, let’s say you service customers in multiple countries and employ multilingual sales professionals. In that case, try routing conversations to your reps based on your visitor’s browser language. We’ve been conditioned to expect instant responses when we talk to people on messaging platforms. Whether it’s Slack or iMessage, people tend to grow impatient as they intensely monitor the three animated dots, waiting for a response. Clearly state your office hours in the messenger. Use a bot to communicate average response times when your reps aren’t available. Hide the messenger outside of your regular office hours. By conveying this rudimentary information automatically, your SDRs can more quickly diagnose a lead’s needs or pain points. They can also afford to be more thoughtful in setting your lead’s expectations regarding next steps (i.e. discovery call with an Account Executive) if you automate low-value tasks — using an automated meeting scheduler is a prime example of this. I’ve heard people attribute success in sales to the three T’s: Talent, Territory and Timing. But it seems people often assume we have little control over timing. That couldn’t be further from the truth. You can gain control over timing by deploying the right live chat solution. By being selective with whom you chat with, you ensure your reps are laser-focused on providing an outstanding user experience to your best leads. By making the live chat experience human and setting the right expectations with your visitors, you drastically decrease the time it takes to convert them to qualified leads. In sales, timing is everything. And live chat enables you to turn “timing” into a big advantage for your team.